It is a teenage horror novel. Soudho likes to write horror stories. He wants to be a reputable horror writer after grow up. He is thinking about a story, name: 'Bhoyal Danober Khappore'. In the meantime, he bought an old typewriter. And he got an old pen as a bonus with it. A wizard was the owner of the type machine and the pen. Soudho wrote the story 'Bhoyal Danober Khappore' by this pen, then sit down with the typewriter. He Will type the script. But he does not know what he is going to be in dire trouble. 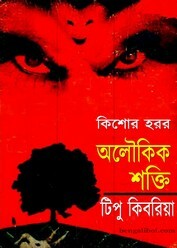 The author Tipu Kibria is very good story teller, specially well-known for writing horror stories. Read the above said book- 'Alowkik Shaokti by Tipu Kibria' from this post as pdf.